Location: Allegany State Park, Salamanca, NY. Cattaraugus County. 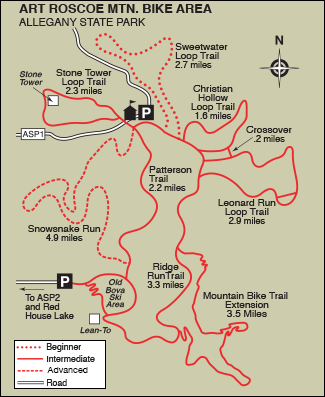 Length/Configuration: 8 loop trails from 1.5 to 9.7 miles in length. Terrain/Surface: Wide ski trails partially comprised of old narrow guage railroad beds. Technical Difficulty: No technical skills needed but the length of some trails require good physical shape and stamina. Several steep descents and long moderate climbs. Elevation Change: Elevations range from 1,500 to 2,350 ft.
Don't leave food unattended around the picnic grounds or camp areas. Bears have a very good sense of smell. Mountain biking is a popular activity in Allegany State Park and tops the list of favorite places for a mountain bike adventure in Western New York during the summer months. In the winter it is a renowned Nordic Cross-Country Ski Center. The park is divided into two sections: The Red House Area and the Quaker Run Area. These two well-developed areas make Allegany State Park the largest in the New York State Park system. Both areas offer camp sites, cabins, beaches, picnic areas, museums, hiking trails and guided nature walks. Located in the northern half of Allegany State Park, the Art Roscoe Ski Touring Area offers some of the finest groomed cross country ski and mountain bike trails in the Northeast. Over 28 miles of multi-use trails attract mountain bikers and equestrians in the summer and fall. The wide trails wind through mixed oak and hardwood old-growth forests and offer spectacular views of the surrounding mountains, forests and Red House Lake. One of the best times to go bicycling here, is during the fall foliage season in October. This area gets a lot of snow, so early in the spring the trails can be described as permafrost mush and during the summer the trails can get crowded. If you arrive during the summer, cool off with a swim in beautiful Red House Lake after your ride. Walkers and bicycle riders can also take advantage of 5 miles of paved trails around Red House Lake and the surrounding area. This historic tudor-style Administration Building built in 1927 during the "depression era" on Red House Lake. Although it has been heavily rennovated, it still retains it's charm. It houses the park's Natural History Museum, the Red House Gift Shop, Red House Restaurant and serves as New York State Regional Headquarters. The Red House Restaurant offers an outdoor dining patio with views of the lake. 130 campsites, 144 cabins, 128 of them winterized and three group camps are available for rent. The Red House Tent and Trailer Area is situated along Stoddard Creek. The entrance is located on ASP1, across from the Redhouse General Store. Red House Gift Shop: Bike rentals and XC Ski rentals are available during the week. Summit Mountain Shop: XC Ski, boots & poles rentals on weekends and holidays. You can also find hot and cold beverages, soups, steaming bowls of chili and other snacks. Connects the Summit Trail to the former Bova Ski Area, with parking provided at both areas. Gentle to moderate downhill grades over a former narrow gauge railroad bed. make this a great ride for novice and intermediate riders. Trail Mileage / Blaze: 11 miles utilizing Ridge Run and Patterson trails and the new 3.5 mile mountain bike extension. The grades are generally moderate with several short, relatively steep sections. Although the trail is rideable by the beginner, it's length and difficulty over varied terrain makes it an excellent ride for intermediate level mountain bicyclist. In 2010 the Master Plan for Allegany State Park authorized the building of three new mountain biking / hiking trails. The Western New York Mountain Bike Association built a 3.5 mile extension that starts at the northern junction of the Ridge Run Trail and the old Summit to Thunder Rocks Trail and ends at the southern junction with the Ridge Run about a mile further south. Trail Mileage / Blaze: 5.5 miles. The trail accesses a remote area of Allegany State Park using moderate grades and several relatively steep sections around the ridge overlooking Leonard Run. Due to length, remoteness and one steep downhill section (if taken counterclockwise) mountain bikers with intermediate level skills will appreciate this trail. A good exercise trail for the rider with limited time or those who arrive late in the day. Gentle slopes and long, flat traverses make this an excellent trail for the beginner. Trail Mileage / Blaze: 3.5 miles. Suitable for experienced beginners. The trail follows reopened truck trails and old logging alignments which traverse the ridge overlooking Christian Hollow. A vista, providing a scenic view to the northeast, is located about halfway along the trail. Trail Mileage / Blaze: 2.3 miles. Developed for intercollegiate cross country ski relay races. Designed primarily for "V" type ski-skating, this trail is groomed and packed. Trail Mileage / Blaze: 4.9 miles. Physically challenging due to long sustained grades and sharp corners. Intermediate and advanced. The park abuts the Allegheny National Forest in Pennsylvania and both are linked via the 4,000 mile North Country National Scenic Trail which travels through New York State and ends in North Dakota. The trail is a designated hiking route that is administered by the National Park Service. It runs through seven states and twelve National Forests. Within Allegany State Park is one of the largest tracts of interior forest within New York State. This tract is 90% forested. This area provides a welcome stopover for migrating birds such as Swainson's Thrush, Blackburnian Warbler, and Scarlet Tanager. It also provides habitat for species of special concern such as the Bald Eagle (threatened), Northern Goshawk, Red-shouldered Hawk, Cooper's Hawk, and Sharp-shinned Hawk. In addition, the park supports a large breeding population of Osprey and one of the largest breeding concentrations of Cerulean Warblers found in New York. This small stone Tower located in the northern section of the Red House area, was built by the Civilian Conservation Corps. It was completed in October 1933. A restored 1926 fire tower sits on one of the highest peaks in the Red House Area. The 60-ft tower is open at certain times during the summer. In the spring during spring run-off or after a heavy rain is the best time to visit these 40-ft high seasonal falls. It flows down a shale hillside and empties into Stoddard Creek. Each June, The Red House Area hosts the Annual Raccoon Rally, a weekend of Road Race, Trials Competition and Mountain Bike Cross Country Races. Art Roscoe's career at Allegany State Park began as a temporary position as Park Forester which became a permanent position in 1930. Art was appointed Manager of the Park in September 1956, a position he held until his retirement on June 6, 1968. Art was the person most responsible for instigating Allegany State Park into developing the first ski tows, ski touring trails and major ski jumps (near the Administration Building) in Western New York. Beginning in 1935, popular ski jump competitions were held at the park. Art mapped out 50 miles of old logging roads and hiking trails for the Interstate Inter-State Ski Club. When the club disbanded in 1972, interest in the sport dwindled and the sport became almost non-existent in the park. Mr. Roland A. Block became Allegany State Park's Regional Administrator in 1972. Part of his recreational facility improvement plan was the establishment of new cross country ski touring trails. By 1977 Allegany State Park had established 12.1 miles of specially designed trails. In 1978, another 5 miles of trail alignment were developed which followed an old Civilian Conservation Corps (CCC) fire road constructed in the late 1930’s. The ski / bike trails can be accessed from either the summit trail head south of Salamanca on ASP1, or from the Bova Ski Hill trail head on the dirt road past Camp Allegany. To Summit trail head: From NY17 take Exit 21. Follow signs to park entrance and take ASP 1 to the Summit Mountain Shop Parking Area. To Old Bova Ski Area: From NY 17 take Exit 19 (Red House Exit) and follow signs to park entrance. Take ASP 2 past red house lake and turn left on the dirt road to Camp Alleghany and continue to the old Bova Ski Parking area.